JAPANESE KNOTWEED – EVERYTHING THAT YOU HAVE ALWAYS WANTED TO KNOW BUT WERE AFRAID TO ASK…. Japanese Knotweed has become a hot topic in property purchasing recently. 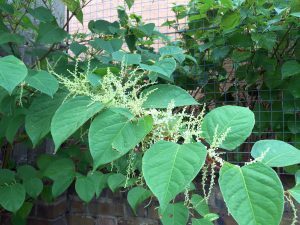 Commonly associated with rivers and railways there was a time a few years ago when having Japanese Knotweed on or in the vicinity of your property meant that some Mortgage Lenders were refusing to provide lending. Greater awareness surrounding the issues concerning Japanese Knotweed has meant that Lenders nowadays are considerably more educated as to the pitfalls and effects of this invasive plant but despite it being such a topic of debate in property purchasing most people do not know what Japanese Knotweed is and how it can affect a property. 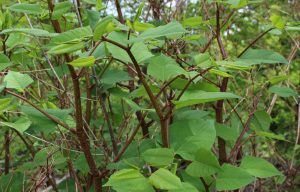 We have put together a Guide which summarises the sort of issues that can be caused by Japanese Knotweed and how to overcome them. It will be useful for anybody looking to sell a property who has Japanese Knotweed in or around their property or prospective purchasers. Japanese Knotweed is an invasive plant which was brought over to the UK in the 19th century. It is not native to the UK and it is particularly fast growing and difficult to eradicate. A picture of a typical Japanese Knotweed plant is above. It’s bamboo like structure can grow up to 3 metres tall and its light green leaves can grow to be 10 to 15cm long. It has creamy white flowering which is often clustered together. It is very invasive which means that it can be spread even by walking on affected areas. In the winter the plant does tend to die down but it is a perennial plant so it will re-grow each year. Japanese Knotweed commonly spreads through its roots which can go underground as far as seven metres. As Japanese Knotweed is so invasive and with its roots growing so deep there have been horror stories in the past of Japanese Knotweed causing damage to the structure of a property and has even grown inside because its roots have spread. It is a criminal offence to allow Japanese Knotweed to spread into the wild and onto someone else’s property. The Wildlife and Countryside Act 1981 makes it an offence in Section 14(2) where it states ‘if any person plants or otherwise causes to grow in the wild any plant which is included in Part 2 of Schedule 9 (Japanese Knotweed is mentioned in that list) they shall be guilty of an offence’. This is a criminal offence. If you dig up or cut down Japanese Knotweed then it is classed as waste under the Environmental Protection Act 1990 so it has to be taken to a licensed landfill site that has facilities to deal with it. You will often find when going to local authority tips or skips they will specifically say that they do not take Japanese Knotweed waste. Failure to maintain Japanese Knotweed if it is on your land can also lead to civil action against you. There was a case in July this year where Steven Williams and Robin Waistell issued a private nuisance claim against Network Rail. They argued that the Japanese Knotweed on the Network Rail land encroached onto their properties and interfered with their quiet enjoyment of the property and also caused loss of amenity as it reduced their market value. The Court of Appeal upheld their claim of nuisance and ruled against Network Rail. 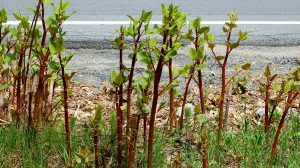 What Damage Can Japanese Knotweed Do? Damage to building structures and roads. Exploiting cracks and weaknesses in buildings. It can split structures along weak points and push up through tarmack and other surfaces particularly if they have been poorly laid. It can interfere with drains and pipes and other structures blocking and sometimes cracking them. It can also interfere with utility services such as cabling, water pipes etc. Do make a start immediately to deal with the Japanese Knotweed issue if it is growing on your property. It grows rapidly particularly during the summer months so leaving it for longer periods of time will only make the situation worse and could result in it spreading to other properties or damaging your property. Remember it is a criminal offence if you allow Japanese Knotweed to spread onto someone else’s property as well as being a civil matter. If you decide to eradicate it yourself try to remove as much of the root as possible and then repeatedly destroy re-growth. It can take a number of years to be effective but the energy reserves in the remaining underground parts eventually become exhausted which stops the plant from growing further. Do not spread contaminated soil. Remember Japanese Knotweed is classed as controlled waste and it is very easy to spread. If you remove it yourself make sure that it is taken to a designated place that specifically deals with Japanese Knotweed. Local Authority skips will not normally accept it. Do not allow Japanese Knotweed to spread to your neighbours’ properties. If it is getting out of control or it looks as though it may be spreading you may wish to consider having a barrier set up to prevent it encroaching onto a neighbour’s property. Remember the roots run deep. Do not contact the Environment Agency, Natural Resources Wales or the Northern Ireland Environment Agency to recommend a suitable contractor. They are limited as to what advice they can provide. If you are selling your property we would strongly advise you to consider employing a professional to treat and eradicate the Knotweed problem. This is likely to take a number of years and often contractors will offer plans ranging from 3 years to 10 years. If you have Japanese Knotweed near your property and you are selling (and this will also apply to people buying properties) it is essential that you have a Japanese Knotweed Plan because Mortgage Lenders will usually only lend when there is a Plan in place. That Plan often has to be supported by an Insurance Policy which the contractor treating the Japanese Knotweed will usually offer. The Knotweed Plans can be passed on to prospective buyers and if you are looking to buy a property and it has Japanese Knotweed on or near the property it is essential that you establish that a Japanese Knotweed Plan and Insurance Policy is in place. If the Knotweed affects a number of properties then it may be the case that the Knotweed Plan will be split among those properties with each household sharing the cost of the Plan and necessary treatment works. We hope that this Guide was useful. If you have any queries please do not hesitate to contact us on 01654 711499/01341 281108 or email abright@alwenajonesbright.co.uk. It may also be useful to contact the Government’s Environment Agency who can be contacted at enquiries@environment-agency.gov.uk or 03708 506506.